A response to Tammy’s plead on FB Was mowing the lawn today and ‘freaking’ scenes and visions came to me. Mentally I was told to write the following with no intention to make it short or long. Agreed! Why don’t we remind people to get rid of useless furniture or clothing with the sign, “from the 99% of struggling America, this is for free!” I said to myself, “yeah, makes sense. We should add, ‘if rich people don’t have time for us, then why we should kiss their asses? '” Not writing in particular order because we jot down things before inspiration leaves the building with Elvis. Another idea came while trimming our garage entrance. Free Flea Market and Exchange Make little postcards offering your service for a free flea market on your front yard. All can donate and bring stuff to your garage. The exchange would be for free, and neighbors would be able to exchange a word or two. You can rotate this Free Marketing asking who would be available for a next “excahnge.” The Elderly Elders and older Fellows are not popular on CNN. Unless they won that freaking Megamillion. Then McKayla Maroney would get mad again… for no getting the media attention. Ops! But babyboomer like us are already living a life of retirements… and hope? 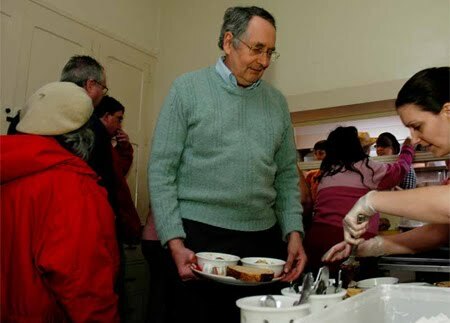 More Hunger, Poverty and Homelessness — How Can We Help?